In upstate New York there is a small town called Saratoga Springs. Why the springs part of the name? Because the town is full of naturally occurring springs. If you are thinking of refreshing and crisp mountain spring water like you can find in the Appalachians further south into the US (if you know where to look) then I am sorry to shatter your picturesque idea. 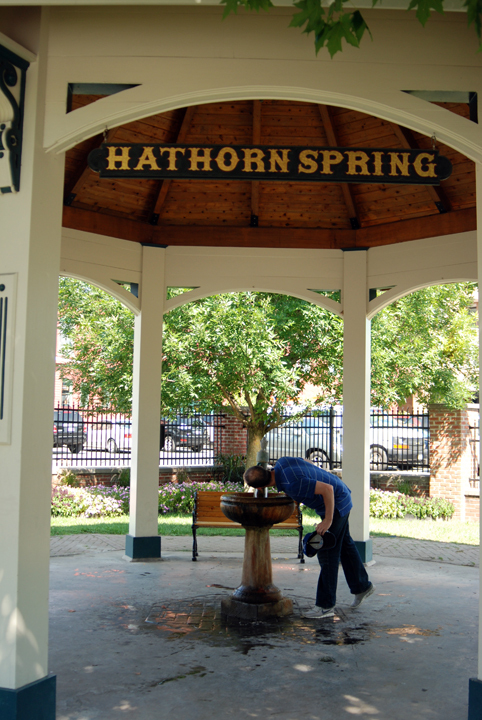 Some of the springs are indeed cold & refreshing and just the thing you need after a hot afternoon at the racetrack (we were in town for the Travers Cup Stakes, pretty much the only reason people visit Saratoga Springs as far as I can ascertain). And by some I mean one or two, maybe three if you go to every single spring. Which can be done, you can go to the information centre and get a nifty little map that shows you were all the springs are. Or so they claim, at least one of those is off by more than a few feet. What of the sulfur springs? Will you be in for a nasty surprise? Only if your sense of smell is out of order, because some of the springs, just standing near them, it smells. Pretty bad. Others not so much, but as you lean in for a sip the smell hits you. If you are adventurous you will not let that bother you and sip away (as seen in the above image). I am not that brave. It was difficult enough to even get close enough for a sip without gagging because of the smell (sulfur, I should mention, smells like rotten eggs). Then there is double-nasty combination of it being carbonated. So what you have is a rotten-egg smelling fizzy drink. I could be parched in the desert and I would still not ingest it. I can say this because I did have a small sip of the sulfur-smelling (not actually containing however, the smell is from hydrogen sulfide gas). It tasted like metal, thanks to all those wonderful minerals. The best part of it is when you see other people and they ask you which springs are “safe” (as in not stinky) and you mischievously send them to the smelliest one you have yet to encounter and then you hang around a nearby spring slyly watching them, hearing their faint screams across the park. And you can share the fun! We brought along water bottles and brought the sulfur-scented goodness home to share with anyone we could corner. But the jig was up real quick, pretty much as soon as they opened the bottle. Still funny to see the reactions and the faces they made.